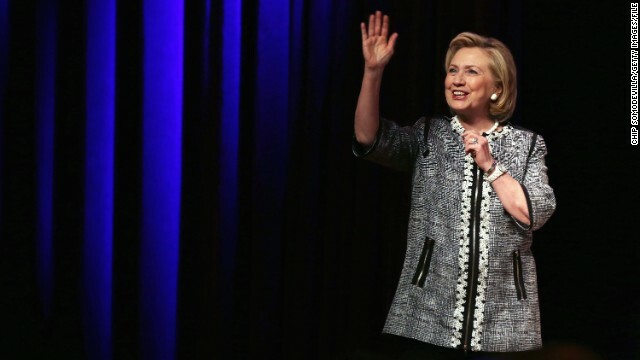 (CNN) – A new poll indicates Hillary Clinton is either tied with or holds a narrow advantage over potential Republican presidential contenders in Iowa and New Hampshire. According to a new NBC News/Marist survey, Clinton is tied with Kentucky Sen. Rand Paul at 45% in Iowa and barely edges out New Jersey Gov. Chris Christie, 44%-43%. The poll also included a hypothetical matchup between Clinton and former Florida Gov. Jeb Bush, who's considering a 2016 run. Clinton is slightly ahead of Bush in Iowa, 46%-42%. The survey comes as Christie travels to the Hawkeye State on Thursday - his first trip in two years to the state that holds the first presidential nominating contest. In New Hampshire, another key primary state, Clinton leads Paul, 46%-43%, and holds a 47%-42% margin over Christie. She's also ahead of Bush in the Granite State, 47%-42%. The Iowa survey was conducted July 7-13, with 558 potential Republican caucus-goers and a sampling error of plus or minus 4.1 percentage points. The poll included 538 potential Democratic caucus-goers, with a sampling error of plus or minus 4.2 percentage points. For questions about the general election, 1,599 potential voters were interviewed, with a sampling error of plus or minus 2.5%. The New Hampshire survey was also conducted July 7-13, with 544 potential GOP primary voters and a sampling error of plus or minus 4.2 percentage points. For questions about the potential Democratic primary, 479 potential voters were interviewed, with a sampling error of plus or minus 4.5 percentage points. On the general election, 1,342 registered voters were questioned, with a sampling error of plus or minus 2.7 percentage points. Well, I'll give this poll all the credit it deserves. It managed to find an equal number of Dems, Indies, and Repubs to question. Which means it's skewed as more Americans identify themselves as dems than they do reds, and more Americans identify themselves as indies than they do reds. However, more Americans identify themselves as dems than they do indies. As one of the Usual Suspects likes to say on this thread "They've got NOTHING". I would add that they have LESS than nothing. The reason the Republicans do not have a viable candidate is because they don't have anyone who has done anything of legislative significance for over a decade. They've allowed themselves to be led by the likes of The Grand Limbaugh, and other folks who could not possibly mount a credible campaign for any elected office. Nothing to worry about here. Just wait til the Republican debates. Once America see's the clown show in full view, that gap will widen. Salty.... With all due respect my brotha... Don't you remember the 2012 election when the GOP stated publicly.... This campaign will not be dictated by facts! Facts smacts, they say what they want whether it's a lie or not and their rabid uneducated base eats it up. Tony would be the person who, in a Tea Party huff and a puff, so proudly asserted that The House controls spending. Everything was fine until I agreed with him and pointed out that the Tea Party House has been the biggest deficit spending House in U.S. history. Blew the roof off, i did. Quite frankly Rudy, there are reason aplenty why the Republican Party is swirling down the crapper. They've become the Party of sore losers and petulance. The Party of self-serving flag wavers. The Party of lip-service to God and country whilst willingly, and wilfully ignoring Christian tenets and destroying our country. The Party of Greed Over People. I know good when I see it and evil when I see it. What passes for a Republican today can KMA. I know, I know Rudy, but he called me on it, so I feel obliged to respond, and got the usual crickets, facts are not kind to the rwnj, you can lead a horse to water.... I do remember, Jeep actually had to buy airtime to set the record straight, how many right wing lunatics refused to believe the CEO, because the gop was refusing to man up, with predictable results. I'll say it again, their party's existence is 100% dependent on ignorance, if the deep south were to wake, they would be irrelevant, very quickly. Clinton may not be able to win her own primary. A vote for ANY GOP member will most certainly result in yet another war for America. A Vote for the Tea Party or the GOP will result in the rich getting richer, not passing any profits down to the middle class, no healthcare and more guns on our streets. The reason being, responsible gun owners are NOT responsible. A responsible gun owner secures their weapon and does everything they can to not allow it to be stolen. A Tea Party gun owner buys and sells to whomever they want, when they want. Regardless of that persons intention or past history. So, Hillary Clinton is still winning despite of the fact the others have been campaigning on and off there for about 6 months now and Hillary has not done any campaigning in these states at all. I have no idea how this spells good news for anyone except Hillary Clinton. And by the way, there is a whole raft of the tea party / libertarians hiding as 'independents' so they are asking a lopsided group of folks who lean to the right. So the fact is Clinton is leading even more than the polls show. "And by the way, there is a whole raft of the tea party / libertarians hiding as 'independents' so they are asking a lopsided group of folks who lean to the right. " There are a few "independents" without any declared ideology roaming around here who deny being Rand Lubbers. It looks like "undecided" is way out front of the rest of the republican wanna bees. That is par for the course for Obstructionist that support nothing for the good of America. Get back to us when the Pee Pot republican party can come up with a candidate who can beat "undecided" and then we will talk about potential presidential candidate. Right now Hillary is "undeclared" and she is 20+ ahead of "undecided" who is nearly 10 points ahead of all the usual suspects.